We’re reviving our publications programme with four new books in the pipeline, and that will just take us through the winter. This is an ambitious plan and we’re starting off with a great one, with huge potential interest from the labour movement and others. 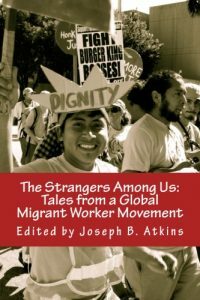 The first book of this new season is The Strangers Among Us: Tales from a Global Migrant Workers Movement, edited by Joseph B. Atkins. This 136 page book offers readers compelling insight from 10 writers around the world (including LabourStart’s Eric Lee) about migrant workers’ rising consciousness of their rights and ability to assert those rights in a global economy that seems to place all power in the hands of mega-corporations. From tobacco workers in North Carolina to Vietnamese domestic workers in Taiwan and the network of organizations that support them, a movement is emerging that will pose a growing challenge to neoliberal rule. The book costs just $9.99 and is available from Amazon and most bookshops. Order your copies here: http://www.labourstart.org/go/strangers And please – post reviews of the book on Amazon and elsewhere. Yes – probably in January.